The glory of yum cha is the chance to say to the waiter: 'I'll have that, and that, and that, and that...' and so on, giving one a feeling of decadence that lasts until the bill comes, when it is replaced by a feeling of satisfaction for wangling so much for so little. That satisfaction can veer close to smugness if, at Shanghai Village, you've also availed yourself of enough cups of free green tea from the communal urn at the front of the restaurant. 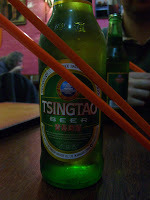 This restaurant suits the lackadaisical approach. T he waitstaff are pretty casual - both in dress and attention to service. But that's OK because you know the food will be speedy and filling. 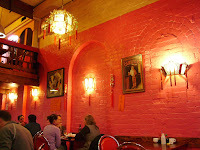 While the dining area is hardly gawdy, the colours employed - on the bright pink feature wall or the disturbingly bright orange chopsticks - are certainly not casual. 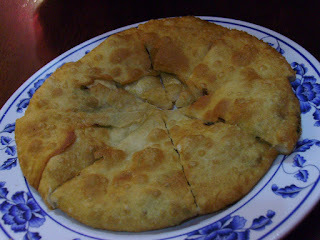 The first dish to reach us was a chinese pancake. It fared well with the addition of soy sauce. Looking a bit like a hollow omelet, and consisting of a very straightforward, fried batter, it served as a great raging-hunger-queller before we got into the meatier dishes. 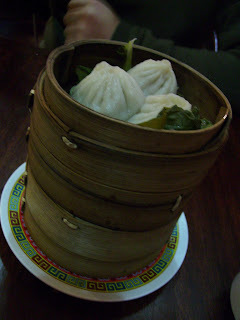 There is no yum cha without pork buns, but this restaurant's offering are not the large sweet-doughed-savoury-filled variety. They're 'mini pork buns' and are more of a dumpling to be honest. The filling is quite respectable, but it's a shame not to have that unique casing, akin to a chewier, more floury meringue texture, to go with it. 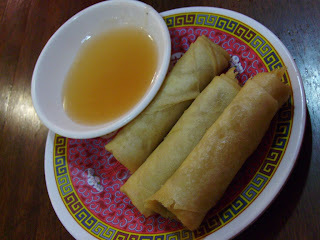 Three spring rolls are suitably crisp, but their accompanying sauce - perhaps plum - is quite bland, and without a killer filling it leaves the dish as a bit rudimentary. 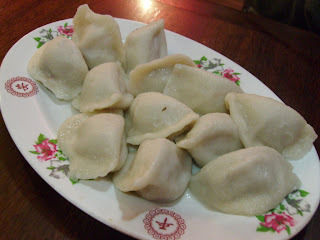 More exciting are the steamed beef dumplings. There's just so much meat and dough goodness on the plate! They are utterly impossible to eat with chopsticks: the dough slipping around and the globe of meat inside inevitably escaping to be eaten solo. Overall the meal was entirely satisfying, particularly as we'd brought voracious appetites to the table. I left with a fairly voracious thirst however, which I doubt was entirely due to my liberal splashings of soy sauce, but rather to some heavy-handed salting in the kitchen.